Here at Choice, we value and appreciate the connections that we build in the present AND those built in the past. Our founder, Heather Adams, is a great role model for us on so many levels, including networking and building lasting relationships in and outside of work. 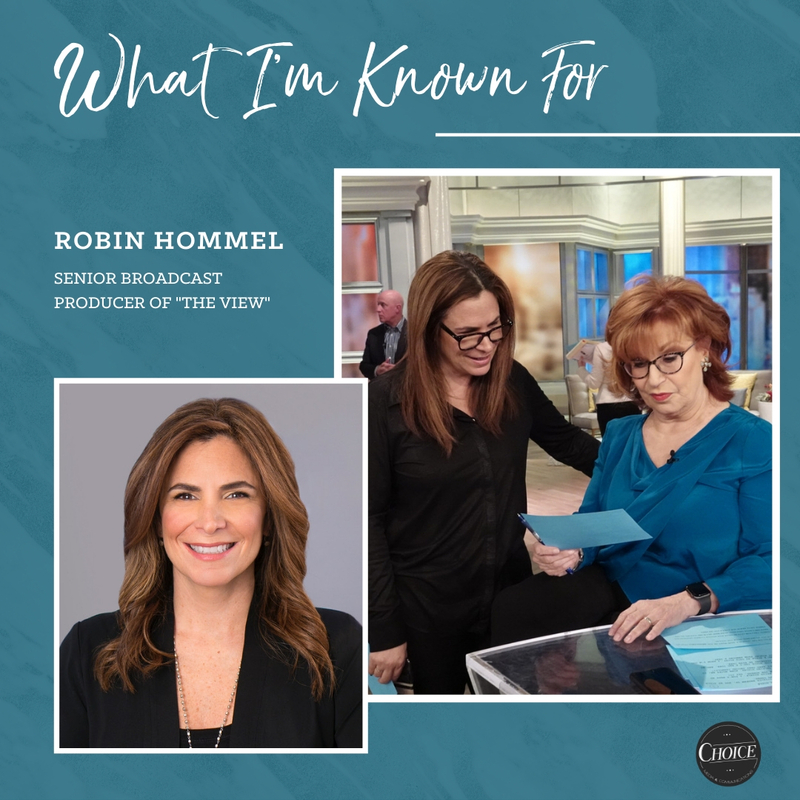 We are so excited and proud to feature one of her very own friends, Robin Hommel, for this month’s “What I’m Known For” column. 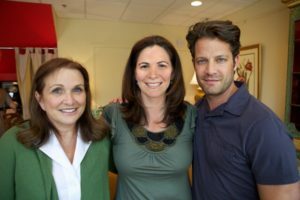 Heather met Robin more than a decade ago when she was launching The Rachael Ray Show. Since then, Heather has worked with her at numerous shows, including The View where she is now. Heather and Robin connected on an even deeper level when they discovered they are both Georgia Bulldawgs AND Grady Grads. 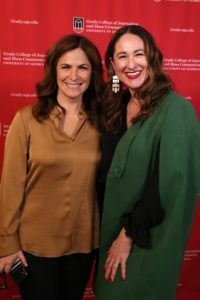 Read below to see Lena’s conversation with Robin – they cover everything from how Robin got into television production to what is Robin’s most rewarding segment. LH: Tell me about your family and how they helped you become who you are today? RH: I didn’t have connections to break into television, but what I did have was two selfless parents. They recognized my desire early on to pursue journalism and made great sacrifices to manifest my dream. My parents worked 2-3 jobs to put me through college. I was afforded the privilege of attending The University of Georgia’s Henry W. Grady College of Journalism and Mass Communication. 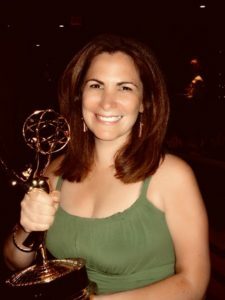 My parents’ hard work, grit and unwavering support helped me forge a path towards becoming a television producer. Today I am lucky to share the joy, fulfillment and career moments with my parents, husband and children. LH: How did you get into television production? RH: I came of age when talk shows were changing the landscape of daytime television. While my parents worked full-time, I had Phil Donahue and Oprah Winfrey as my babysitters. 3-5pm was my continuing education. I learned about racism, sexism, health epidemics, political and economic battles and social causes. I knew this was right where I wanted to be one day. In junior high and high school, I pitched stories, conducted celebrity interviews and wrote features for Kidsday, a column in the NY newspaper, Newsday. In my sophomore year of college, I obtained tickets to a taping of the highly-rated, nationally syndicated, Montel Williams Show. At the end of the taping, I walked over to someone wearing a headset and asked how I could land an internship. I offered to clean offices, organize the mailroom and get coffee. 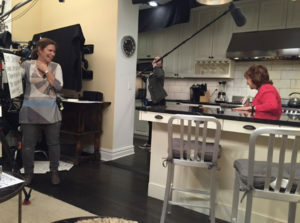 The person on the headset turned out to be the show’s Executive Producer. I was handed a business card and told to call the next day. The following week, I began my internship and aside from cleaning offices, organizing mail bins and getting coffee, I was booking guests and securing trade outs. When I graduated from college, I landed my first gig as a Production Assistant at The Montel Williams Show. I spent the next 8 years there, learning every job and working my way up to Producer. LH: As a prolific television producer, you’ve made your life’s work about telling important stories. Why do you think audiences are so captivated by storytelling? RH: I think there’s an inherent desire to learn how people face challenges, handle adversity and evolve. Great storytelling allows us to gain a deeper insight into the human condition and find points of connection with one another. LH: How has the television industry changed during your career? How does social media now play in to what you do? RH: When I started out, the expectation was to choose one specific role/track and you more or less stayed in that lane. Once social media and digital platforms exploded, it was essential to become a one man/woman band- write, shoot, edit and produce. Social media has certainly changed the way we build and promote content. From ideation to execution, we’re thinking of the layers of a story, how to continue the conversation and build audience engagement across all of our platforms. LH: What are some of the biggest challenges you have faced in your career and how have you overcome them? RH: The biggest challenges occurred when some of my favorite gigs came to an end. As a colleague once said, “the show must go off. And it did. It wasn’t the first time and sure won’t be the last. Like anything else in life, you try to make each day count and never lose your sense of humor. The uncertainty of a show’s future does have an upside. I’m inclined to take more creative risks and that is liberating. LH: Heather has worked with you for years, as have many in this industry. What is one thing Heather and others would likely be surprised to know about you? RH: I volunteer during my summer hiatus at a non-profit sleep away camp. I was a camper and counselor back in the day and it was a transformative experience. I am now able to use my producing skills for a place and purpose close to my heart. I book inspirational speakers and produce workshops for kids ages 7-16 focusing on self-confidence, team-building and social causes. LH: What is your most rewarding show/segment to date? RH: In my 20+ years, there have been a number of segments that stayed with me but two in particular left an indelible mark. In 2010, I booked an exclusive interview with Elizabeth Edwards whose life had just been turned upside down. Her marriage imploded, a political and personal scandal with John Edwards erupted, and she was battling terminal cancer. She invited Nate Berkus and I to her home in North Carolina. When we arrived we were met by a woman not defined by her circumstances but by grace and resilience. Elizabeth spoke about reaching for the things that give you comfort, your children and your loved ones and finding the beauty throughout the journey. More recently at The View, we partnered with Homes For Our Troops, a non-profit organization that builds specially adapted homes for severely disabled veterans. We met Navy PO2, Tim Birckhead who is battling an incurable, progressive disease affecting his sensory and motor nerves. Tim’s indomitable spirit and the love and support from his family was deeply touching and inspiring. With the help of my colleague and View co-host, Whoopi Goldberg, former co-host, Sara Haines, designer, Carter Oosterhouse and our sponsors, we designed a home featuring all the functions, beauty, comfort, and independence Tim deserved. The greatest moment happened during the reveal of his man cave. 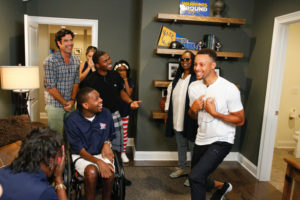 We flew in Tim’s NBA idol, Steph Curry of the Golden State Warriors, who surprised Tim and his family. The most rewarding part for me was forming a special bond with the Birckhead family and paying tribute to our veterans. LH: What is the best advice you have ever received? RH: Best advice I ever received: make yourself indispensable. 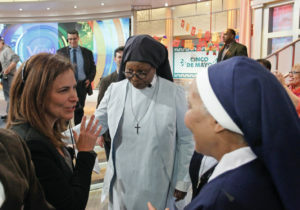 Best lesson I ever received (thanks to the fearless ladies of The View): speak up, speak out and use your platform for good.